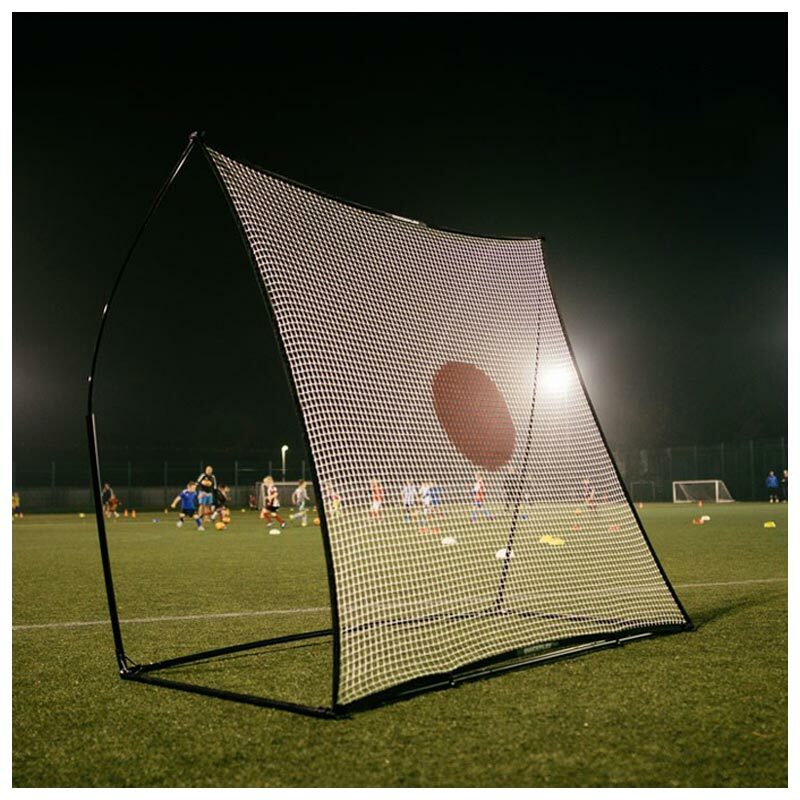 Quickplay Spot Rebounders are perfect for players and coaches alike either as a fun game or a serious piece of training equipment due to its portability and durable construction. Specifically designed for football acts a giant target for training your skills enabling multiple players to develop accuracy, power and control. Small pack size and lightweight. Simple and quick to assemble in only a couple of minutes. All poles are pre-attached with elastic cord (just like a tent). Making it easy for anyone to assemble and reduced lost parts. Robust and flexible design, with the ability to deform and instantly reshape. Durable, easy open carry bag with shoulder strap. Kickster Spot Rebounders can be easily carried by children and are small enough to pack easily into a family car to go to the beach, park or anywhere. Designed and manufactured by Quick Play Sport and tested to BS EN71. 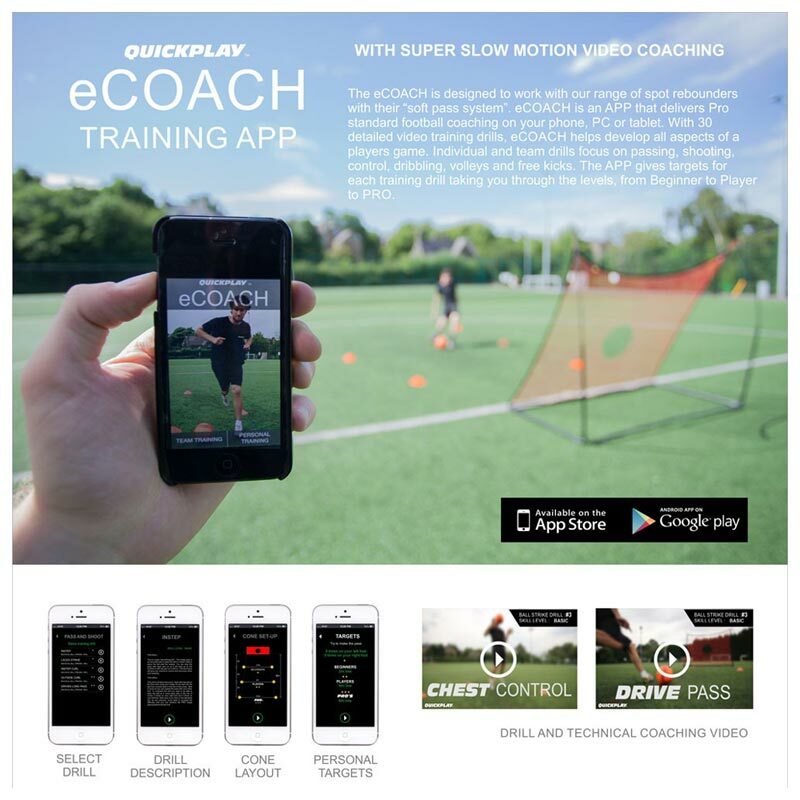 Designed for the eCOACH training App, with over 30 detailed coaching videos and training drills. L 244cm x H 152cm (8ft x 5ft) - Packed dimensions - 10cm x 19cm x 97cm. Purchased this rebounder net for my son's 8th Birthday present - he loves it and can play football, rugby and tennis against the net - great fun and saving my garden plants in the process! 5 out of 5 Awesome! This is a brilliant product, my 8 year-old son loves it but it does need an adult to put up though.The on-line app gives some good training ideas but he has the most fun playing the ones he's made up with his friends. I fully expect him to be one of the best footballers in his year by the time September season comes round! 5 out of 5 Great! Excellent product, my son's football skills are improving. Good sturdy rebound net . My son uses it in the garden and loves it. a great tool for practising skills and reactions. Easy to assemble. Lots of fun. our 11 year old grandson, thinks this is the best birthday present he's ever had! My sons both very pleased (7&9). Quality product, as most quickly are. Fairly easy to put together but final clip needs a big pull to get the tension, so adult assembly required. Having used the carry bag yet as boys not wanted to pack away yet! This has helped protect the garage wall from being blastered with kicks which the rebounder can just soak up and return - so added benefit, it is quieter than kicking the ball against a wall! Good price, well packaged and arrived promptly. 5 out of 5 Great item. Very sturdy and robust. Relatively easy to reassemble - need strong arms for first assembly though. Popular with the boys in the house. Bought this for my little boy. He spends hours using it in the garden. Great for one two's and helping control the ball. 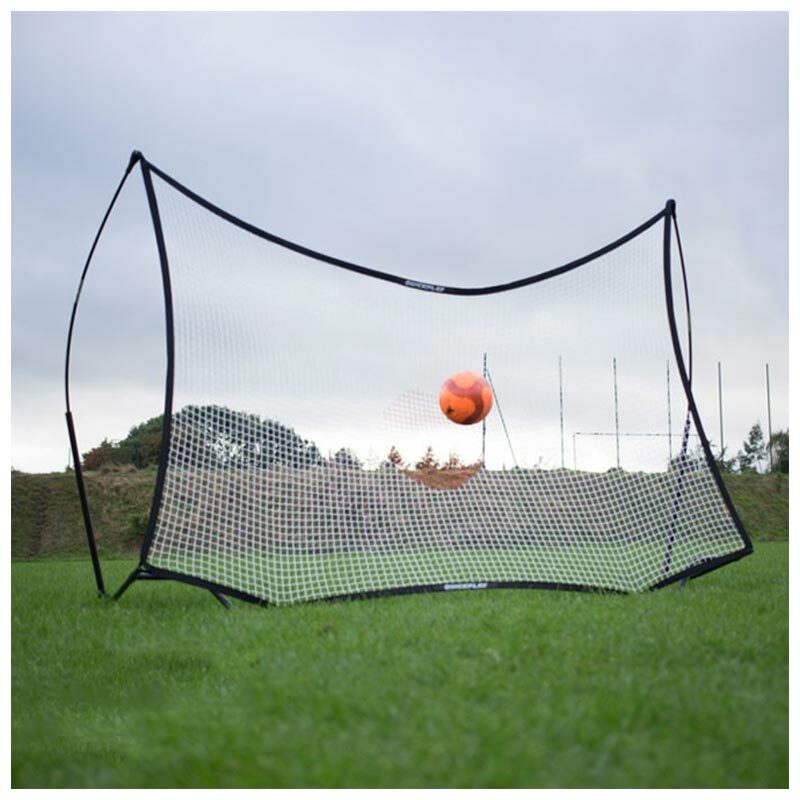 Kids love using this during training, there's some great drills to do with the rebounder and it can be used to train all the squad (goal keeper and players). It's good for all abilities because everyone can go at their own pace. The kids can work on all aspects of ball control and accuracy in groups or on their own. Overall a great piece of kit for coaching. Delivery was quick and the rebounder is easy to build and brilliant to use. Hours of fun for a 10 year, even when playing on his own. The net arrived damaged, with one strand broken, but Newitts sent a replacement straight out to us without quibbling so fantastic customer service. 5 out of 5 Brilliant! Got this for my son. Quite easy to put up and is held securely with the pins provided. It takes a bit of effort to get the tensioned net secured - especially if you attach the optional clips at the bottom (this makes the net even more springy but allows a ground pass to rebound back in a gentle arc. It can be used for a passing aid - either volley passes or, from further away, a pass, control, pass exercise. It often gets used as a 1-2 aid - basically a long pass into it then controlling the rebound before shooting at a goal. Absolutely brilliant - wish we had got this sooner!!! Delivery was fast and the product is good for any sort of ball handling practice. Been used for rugby, netball and football so far! A fantastic piece of equipment for my 13 year old son. Getting him out in the garden more than ever practising skills without needing anyone else. Fab! Would recommend this Rebounder to any football mad person, young or old. Ours has been ( easily) set up in our garden and is being used by a 4 year old, a 15 year old and a 21 year old! Different skill levels but the Rebounder allows tem to go out and practise their ball skilla whenever they like.